The South Fork of the American is a Class III river. The South Fork offers some of the best whitewater rafting with proximity to the San Francisco Bay Area. The rapids on the South Fork are "rock garden" style rapids: meaning rocks in the channel create the rapids. Large pools follow each rapid, allowing time to regroup after that unexpected, out-of-boat experience. 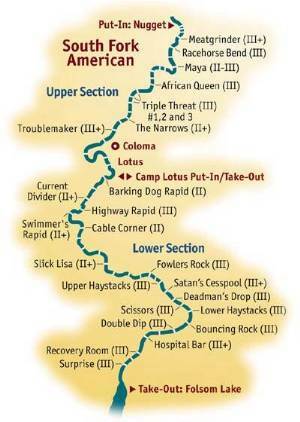 You can raft the upper stretch which puts in at Chili Bar or you can raft the Lower which puts in at either Camp Lotus, Henningson Park, or Marshall State Park. 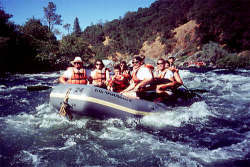 Many of the commercial Whitewater outfitters including All-Outdoors California Whitewater Rafting put-in at Camp Lotus. From Chilli Bar Bridge, the river descends at a steep gradient of 30 feet per mile. The first 5 miles of rafting are chocked full of exciting Class III whitewater with rapids like Meatgrinder and Trouble Maker. The next 9 miles descend 9 feet per mile through the Coloma/Lotus valley and consists of numerous Class II rapids. The last 5 miles are mostly Class III descending 33 per mile, with challenging rapids such as Fowlers, Bouncing Rock and Hospital Bar. The following mile-by-mile river map contains the most common names of the rapids. It is not uncommon for boaters to have different names for some of the rapids. 0 Put-In: Chili Bar River Access. Fees charged. 2.0 African Queen Rapid. Class II. 3.1 Triple Threat Rapid Class III. Miner's Creek. on river right. is a recommended lunch stop with rest room facilities. 4.4 Indian Creek enters on river left. Beginning of Quiet zone. 5.2 Troublemaker Rapid. Class III+. 5.2 American River Resort River Access and Campground. Fees charged. 5.5 Coloma Resort River Access and Campground. Fees charged. 5.6 Coloma Bridge. built in 1917. 6.0 Marshall Gold Discovery State Historic Park - North Beach River Access Area. Fees charged. Picnic and rest room facilities. Take-outs are prohibited. 7.1 Old Scary Class II. 7.4 Highway 49 Bridge River Access. Parking under bridge is prohibited. 8.0 Henningsen-Lotus County Park River Access (funded by the Dept. of Boating and Waterways). Fees charged. Upstream and downstream from this park are small parcels of BLM public lands. 9.0 Camp Lotus River Access and Campground. Fees charged. 9.1 Barking Dog Class II. 10.6 Current Divider Class II+. 11.5 Greenwood Creek on river right. End of the Quiet Zone. 12.0 Cable Corner Class II. 12.2 BLM public land on river right is a recommended lunch/camping area with rest room facilities. 20.5 Salmon Falls Bridge take-out on the right bank upstream of the bridge. Parking fees charged.